Returning letterwinners for the Menomonie boys track and field team are Simon Fichter, Adam Wilson, Patrick Schwartz, Adam Giljohann, Rocco Jemillo, Shawn Halverson, Ryan Westphal, Jed Ogea, Kaleb Kazmarek, Brock Thornton, Dylan Boecker, Devin Williams, Jed Ogea and Sam Zbornik. The Menomonie girls track and field team returns a number of letterwinners for the 2019 season. 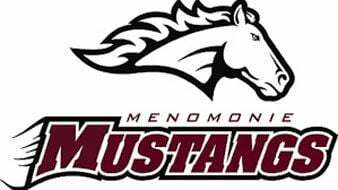 The Menomonie track and field program returns plenty of talent this spring that is already making an impact in competition for the Mustangs. Both teams finished in the top half of the Big Rivers Conference a season ago and are poised for more success this season. Patrick Schwartz qualified for the state cross country meet last fall and leads the distance runners for the boys team. Ryan Westphal, Simon Fichter and Wyatt Hanson return and all have qualified for sectionals in the previous two seasons. Shawn Halverson was a sectional qualifier in the pole vault last year while Adam Giljohan was fifth in the event at the Big Rivers Conference meet. The boys once again bring a strong set of jumpers to the pits. Devin Williams just missed state in the triple and long jump events a season ago while Sam Zbornik is back after qualifying for state in the high jump as a junior. Dylan Boecker and James Schemenauer had success last year and return. Seniors Adam Wilson, Logan Sorenson, Williams and Kyle Field lead the sprinters for the Mustangs and sophomore Will Ocker will see plenty of action as well. Senior throwers Michael Munoz, Sam Thompson, Aiden Raduzel and Ryan Sisko return, as do juniors Josh Boettcher, Carter Luzinski and Andrew Fenton. Zbornik was second in the 110-meter and 300-meter hurdles at the BRC championships last year. Italian foreign exchange student Matto Mocco has already put forth strong times this spring in the 800 and sophomore Richard Palma was a state qualifier in two relays last season at Cochrane-Fountain City. Boys coach Craig Olson enters his eighth season as the head coach. Girls coach Matt Flug returns for his 20th season as coach and like Olson’s boys team has many strong performers back. Kaylynn Imsande is among the program leaders in the 800, 1,600 and 3,200 and already has a victory, winning the 3,200 at last week’s Blue Devil invite. Destiny Haldeman won the shot put at Saturday’s Northern Badger Classic and advanced to state a year ago in the shot put. The versatile Kylie Mogen is back, as is MacKenzie Flug who will be counted on along with Imsande to lead a talented but young group of mid/distance runners. Teagan Bignell will be a leader for a group of younger throwers, Tori Harmston showed versatility by competing in running and jumping events. McKinley Davis enters the season healthy and ready to compete in the sprints and hurdles, Payton Wilkerson-Hardy will compete in the pole vault and discus and Jenessa Hoveland was the girls team’s most improved athlete according to coach Flug and will aim to keep that momentum going this spring. Chloe Oehler had a strong first season last year in the hurdles and pole vault while Olivia Peterson is expected to be a key sprinter for the Mustangs, especially in the 400. Youngsters Paige Anderson, Maddy Palmer, Emma Mommen and Ali Ruch are expected to help in the distance events while Helen Chen, Shelby Thornton, Melody Greenwood and Paige Ferguson and others will also play roles for a young, but talented squad. Menomonie concludes the indoor season on April 2 at the Big Rivers Conference indoor relays at UW-Eau Claire. The Mustangs are scheduled to open the outdoor season on April 11 with the Menomonie outdoor opener. The Big Rivers Conference championships is at Eau Claire North on May 13 and the Mustangs host a Division 1 regional on May 20. March—15, Dunn County Invite; 19, at Blue Devil Open; 21, at Freshman/Sophomore invite (UW-Eau Claire); 23, Northern Badger Classic (UW-Stout). April—11, Menomonie outdoor opener; 16, Big Rivers Conference True Team at Hudson; 18, at Colfax invite; 23, Middle Border Conference vs Big Rivers Conference (Eau Claire North); 30, Menomonie JV. May—3, at New Richmond relays; 7, at St. Croix Central; 9, at Hudson JV; 13, Big Rivers Conference championships (Eau Claire North); 14, JV Big Rivers Conference championships (Hudson); 20, Division 1 regionals at Menomonie; 23, Division 1 sectionals at D.C. Everest.